HORSE POWER: WITH THE LAST SPECIFICATIONS OF THE ELECTRONIC BOX: 480 HP, AND 550 HP WITHOUT ADMISSION AIR SEAL. 6 SPEED GEAR BOX AND SEQUENTIAL SHIFT MECHANISM. HISTORY: ONLY A FEW RACES. 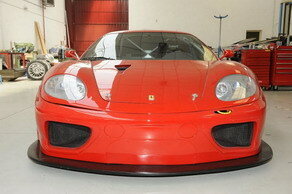 THIS CAR WON THE 1000 KM OF LEMAN´S 2003. MICHELOTTO MADE ONLY 6 UNITS FOR THE ENTIRE WORLD, AND THERE ARE ONLY 4 REMAINING. BEFORE BELONGING TO LUIS MONZON, IT WAS OWNED BY PLAY TEAM.